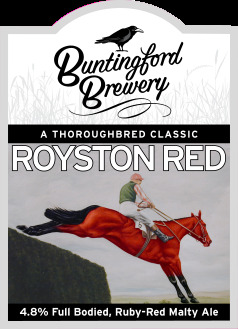 Hi, welcome to Buntingford Brewery’s Web Site! We brew at the Brewhouse at Greys, in North Hertfordshire, and serve the local area as well as working with out friends at Titanic and Burton Bridge to bring you a wide range of guest beers to compliment our own offerings. Please take a look at our wonderful ales, and the other guest ales we can supply! You can even place orders here too, and we can take payment over the phone. Discounts are available for multiple orders, and brewery pickups, too. Supremely hoppy citrus character with an underlying malty-sweetness. Brewed with a magical blend of wheat & barley malts, and a heady cocktail of hops from the USA, chosen to pack a citrus punch.